Subnet Calculator for the Palm Pre! Designed to be easy to use while presenting information in a way that is accessible and intuitive. To use it, enter your IP address in the text fields provided. 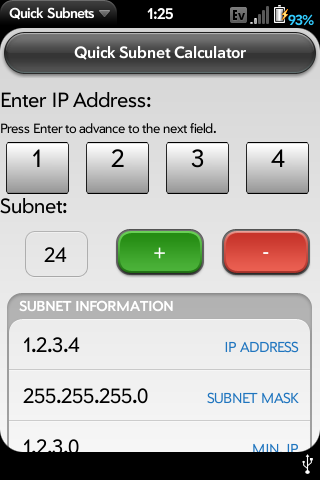 The information will be calculated as you enter the IP, or whenever the subnet changes. Changed help screen to display properly on the Palm Pixi. Corrected error where the Network and Broadcast addresses would generate impossible IPs if a number larger than 254 was entered.